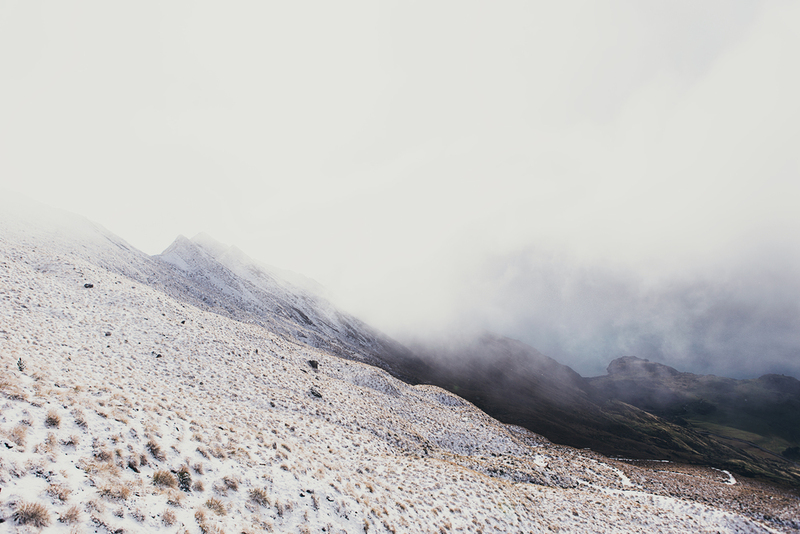 The hike that I had looked forward to the most in New Zealand was Roy's Peak. A 16km track up a mountain overlooking Lake Wanaka, Roy's Peak is one of the most popular hikes near Wanaka and the photos I had seen in my research were amazing. I woke up my second day in Wanaka hoping the weather would have cleared enough to make the hike, but the forecast still showed scattered showers. There were enough hours of sun being forecast though that I decided to just do it anyway. I packed my backpack and put on the thermal layers I brought for this one occasion and set out to the trailhead just a 15 minute drive from the town center. The Roy's Peak track was a new kind of trail for me because it is a simple ascent up a bare mountain with no trees. The first section crisscrosses cattle land and is carpeted by a thick, soft layer of grass making it easy walking, albeit steep. 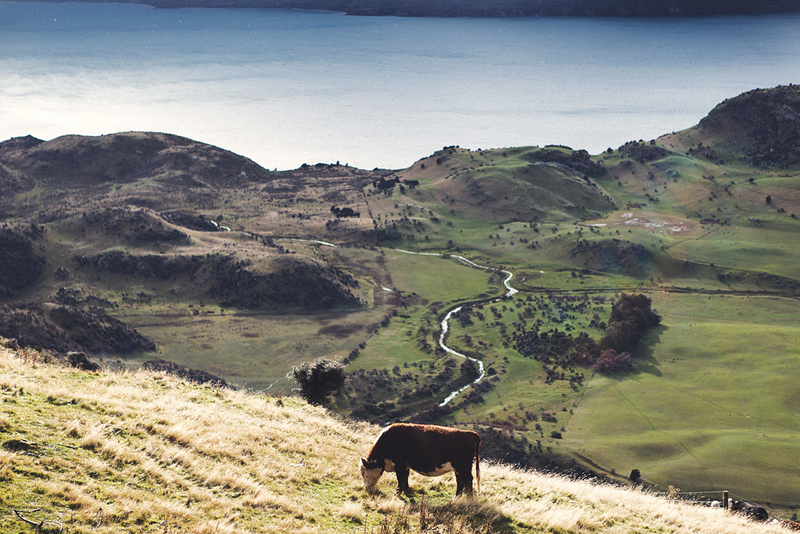 Grazing cows followed me with their eyes as I made my way steadily up and the shining blue of Lake Wanaka stretched out below me. The lush green fields faded to a golden yellow I kept on. A light drizzle had me put my hood up as the temperature dropped and the snow capped peak high above seemed not to get any closer. Gradually the color slipped out of the terrain and the rain turned to sleet and then quickly to snow. I found myself in a muffled expanse of white below and above me. The snow grew heavier closer to the ridge and the greens and blues below weren't visible at all. I pressed on, but any hope of seeing the incredible views from the summit had already been dashed. Cold and with weary knees, I reached the summit barely able to see my hand in front of my face. I met two other Americans (the only other people I had passed on the hike) who sheepishly asked me if I had any water or food to spare. I don't know what they thought their day was going to be like that they didn't bring anything with them. After sharing some provisions and swapping travel stories, the two headed back down and I wrapped myself in my camp blanket hoping beyond hope that there would be a break in the clouds and I could catch a glimpse of the view. After about 20 minutes an inch of snow had accumulated on my body and I could barely feel my extremities so I admitted defeated and began trudging back down the new several inches of new snow on the trail. Despite the rain and snow, Roy's Peak was one of the best hikes I've ever been on. Going from lakeside all the way to a barren alpine ridge with winds blowing snow up the slope was one of the most dramatic experiences I've had in nature while being carried by my own two legs in a single day. Not having the time to do any of the Great Walks or other multi-day hikes, Roy's Peak was a fantastic consolation and hands down my favorite day hike to date. Who wants to go back to Wanaka in the summer with me?